The Opening Experience! Words cannot begin to describe our Opening Ceremony Experience from Beijing last night. There simply isn't the vocabulary that has the ability to draw deep enough meaning. It was the thrill of our lives to walk through the tunnel and into the Stadium surrounded by our country's great athletes and wearing the Team USA uniform! Our day started very early on 8/8/08 as we boarded a charter flight from Qingdao to Beijing with sailors from all nations. Once we landed in Beijing the US sailors checked into the Olympic Village and had the afternoon free to roam the campus. The first stop was the dining hall and, wow, what a place! The cafeteria must be almost a kilometer long with more food choices than a New Jersey mall food court (complete with a McDonalds). We also checked out the athlete entertainment center, gym, pool and yes, even took a 30 minute crash course: Chinese 101. By 4:30PM we started dressing in our parade wear and gathered in front of the USA housing building. After a few photos we boarded a bus to the Fencing Hall to meet President Bush. The President gave a short but potent pump up speech to the US athletes then posed for a photo with each sports team. We also got the opportunity to meet athletes from other sports and snap more photos. In addition, there was a fair bit of marveling at how great everyone looked in the opening gear! Next we moved into the Gymnastics arena, which was transformed into a waiting/queuing area for the opening ceremony. National teams were seated around the arena by marching order. In the Chinese alphabet the United States was 140 of about 204 nations for last night's order, so we had some waiting to do. Side note: this was a lucky break as the letter U in the English alphabet would have put us even farther back! Once the USA was announced, it was marching time.. or so we thought. It took about 30 minutes to leave the gymnastics arena, followed by another 45 minutes to walk across the street. It was during this time that we were first exposed to the crowds of excited Chinese fans lining the walkway. Talk about enthusiasm- these people were out of their minds energized. The atmosphere was contagious as every step we took, albeit slow, brought us closer and closer to the tunnel leading into the stadium. Inside the tunnel the entire US team broke into a beefy chant of U-S-A!, U-S-A!, U-S-A! but we were quickly drowned out the by crowd as we broke into the stadium. This was a moment we will never forget--the roaring of the crowd, blinding flashes from 1000's of cameras, countless American flags waving in the masses of people and the electricity in the humid Beijing air. The highlight of the loop was marching passed President Bush and his entire family, where US athletes tipped their driving caps. The President acknowledged the team by standing and pumping his fists. Once the ceremony was over, we exited the stadium and boarded buses back to the village at 1AM. We'd been traveling since 6:30am, standing for almost 8 hours and sweating buckets the whole night but we were too excited to go to sleep. Where, might you ask, would thousands of energized Olympic athletes migrate to at 1AM? The dining hall, of course! And the place was jumping with activity. There might have been a lapse in our diets as we enjoyed an ice cream and took in the scenery. Athletes of every nation, still in their parade ensembles, were reliving the night. At 2AM we finally turned in and set our alarms to make the morning flight back to Qingdao. 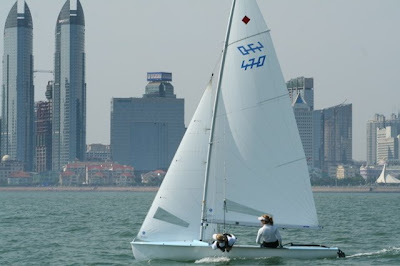 Once back in Qingdao, we took our sails for the final measurement task: country call letters and names. Watching the Chinese volunteers affix USA to each side of the sail was a big moment. More amusing was when they moved on to our names. CLARK was business as usual but sticking MERGENTHALER was a larger job to tackle. They couldn't seem to get it straight so coach Bunny took matters into his own paws and did it himself! Our practice race is tomorrow then the main event begins on Monday, August 11th!